The angelic waterfall, Angel Falls, is perhaps the most majestic natural landmark worldwide. Angel Falls is the most magnificent as it can be seen on our planet from space and reaches nearly 1km in height. It is located within the South American country of Venezuela and is the main tourist attraction and of course is the cause for national pride. Angel Falls locally is known as the Kerepakupai Meru, which literally means "waterfall of the deepest place"
Angel Falls is part of the National Park Canaima National Park, located in Bolivar state Venesuela. This phenomenon runs down the mountain, Auyantepuy, which is one of the largest such mountains, ending with a plain flat top and high walls. It is located in the western part of the park, but only around a dense tropical forest. Angel Falls was formed in the Venezuelan region of Gran Sabana, and today it is included in the UNESCO list of world cultural heritage. Angel Falls accounted for the place that was also called, Devil's canyon, probably because of the immense power with which the waters flow from 1km of height. At the highest point of the spectacular water flow the height reaches 807 meters. In fact, a such enormous distance provokes falling water well before it reaches the surface to disperse into billions of small drops which also forms evaporation resulting in a fine mist that seems to spread by the wind. All this occurs from 300 meters and above before the water reaches the bottom end. After the waters of Angel Falls reaches the bottom pool the water runs down the Kerep River, which in turn continues down to the Churun River, tributary of the Carrao River. Although locals call the largest waterfall in the world, Kerepakupai-merú, the water fall is known as Angel Falls. Its name comes from, Jimmy Angel who first discovered the waterfall. Mr. Angel was a pilot and avid prospector and as such, went around through the inaccessible rainforest of Venezuela, thus, accidentally ccoming across the most spectacular aquatic creature on the planet in 1937. 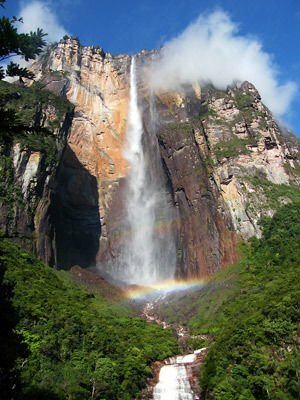 Today there are several options to see Angel Falls - by hiking trips or you can rent a private jet or helicopter. The last option allows you to enjoy the spectacular natural creation which you can do only by air, however, there is no guarantee that at the time the sky would be clean, bright and will provide better visibility for tourists. Initially you are in transition crossing above the rivers Carrao River and Churun River, then you have one hour crossing the virgin jungle which takes you inside the base of Angel Falls. In the very basis of the waterfall under the water base are billions of huge drops. The flow of the tones of cubic centimeters creates a most deafening noise. This part of the Angel Falls is very dangerous and can be life threatening, therefore careful attention is needed at all times.